In case y’all don’t already know, two of my biggest passions are entertaining and hosting friends and family at parties. A small but important part of heading my own party planning committee is having an arsenal of great drink recipes, like sangria, on hand. As much as I love classic Spanish sangria, I’m a firm believer that cinnamon can make just about anything taste better. I’m also a big fan of cinnamon apples. Since fall calls for cinnamon everything and apple orchards grow like weeds up here in Maine, I decided to make a seasonal batch of Cinnamon Apple Autumn Sangria, a sweet and spicy spin to my traditional sangria recipe. I was also entertaining a tough crowd, so I didn’t want to take any risks with the wine. Located just east of San Francisco in the historic Livermore Valley, Wente Vineyards is recognized as one of California’s premier wine country destinations, featuring wine tasting, fine dining and championship golf. And because they’re so awesome, they’re giving all Diary of a Debutante readers free shipping with code JRNYSHIP1 on the Wente website. All the ingredients and instructions for this special autumn sangria recipe are listed below in a fancy printable format, so feel free to download, share, print, etc! If you're looking to entertain this fall, here's a sweet and spicy cinnamon apple autumn sangria recipe that everyone will be asking about. Made with brandy, apple cider, and a mixture of cinnamon, apples, pears, and oranges, this is a more flavorful adaption of Bobby Flay's original fall sangria recipe. Double or triple all quantities for parties or large gatherings. 4+ hours before starting the sangria, combine the sugar and 1 cup water in a small saucepan, bring to a boil over high heat. Cook until the sugar is completely dissolved. Transfer the simple syrup to a mason jar, add the cinnamon sticks, and let chill in the refrigerator for a minimum of 4 hours and maximum of 48 hours. Note that the longer the mixture sits, the more intense the cinnamon flavor. Once soaked, remove the cinnamon sticks and set aside for the sangria. Combine the wine, apple cider, brandy, Cinnamon Simple Syrup, soaked cinnamon sticks, and chopped or sliced fruits in a large container with a lid, and refrigerate for a minimum of 4 hours and a maximum of 72 hours. Transfer to a pitcher or beverage dispenser and serve over ice. Note that you can substitute flavored brandy instead of traditional brandy for a fruitier taste. Bobby Flay's recipe recommends using 1/4 cup plus 2 tablespoons apple brandy and 1/4 cup plus 2 tablespoons pear brandy. If you aren't a fan of sweetness, reduce the amount of cinnamon simple syrup to 1/4 cup. Also, if y’all want some more wine inspiration, check out this fun video on Wente’s facebook page. Wine and music are two of Fifth Generation Winegrower Karl Wente’s biggest passions. You can listen to fifth generation winegrower Karl Wente talk about his band Wolf Hamlin & The Front Porch Drifters and draw parallels between the art of winemaking and the art of writing music. Definitely worth a watch! What kind of fun fall drinks are you mixing up this year? 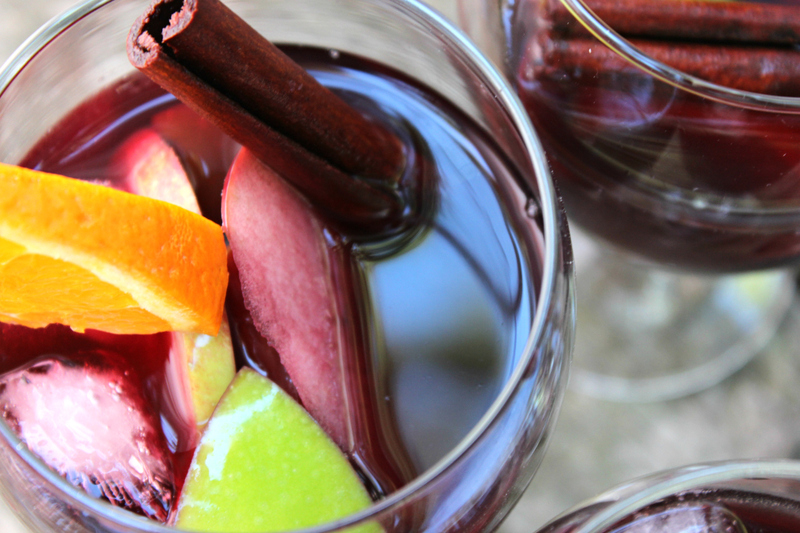 What does your go-to autumn sangria recipe look like? I’m in for a cold winter, so I can use all the warm cocktail recommendations I can get. Please and thank you! Oh, and if you’d like a fun non-alcoholic drink, this cinnamon apple pear infused water is seriously delish (and detoxifying)! This sangria recipe looks and sounds delicious!!!! I tried the Wente Cab and yes it is a wonderfully full bodied Cali Cab???????????? I tried this recipe, but I used Apple Bourbon vs brandy and it was a huge hit!! I added some nutmeg and doubled the cinnamon. Great recipe!